I made a goal for myself and a promise to you that I would blog every day for 30 days. And even though my life right now is not where I expected to be I need to complete my goal. Well today my friend got new bedroom furniture and so she needed some where for her treadmill to be and where she could still use it. So here it is in our den. 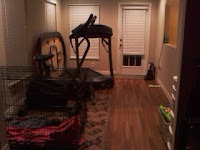 We already had the bike and the bench so it was fitting to have the treadmill also. Hopefully we will really stick to working out everyday. It is time to stop the excuses and get working more on my health and wellness. Looks like a nice little workout area! Thanks it does the job well and it is a nice little dog area too!